Have you contacted us to book your upgrade to Epicor 10.2? Just released, Epicor ERP 10.2, the latest version of Epicor ERP, may be just the thing your business needs to address some longstanding issues with your current release. Building on the strengths of its cloud-first architecture, Epicor ERP version 10.2 is now generally available and delivers significant performance enhancements designed to enable manufacturers to grow and compete in today’s global landscape. Performance Focus: Epicor ERP 10.2 incorporates many enhancements throughout the ERP platform and demonstrates Epicor’s continued focus on performance and quality to improve stability and user experience. Epicor focused on ease of use, product quality and optimizing and integrating business operations across the solution to help increase productivity and grow your business. Better Business Insights with Epicor Data Discovery (EDD): The Epicor Home Page has been completely redesigned with BAQ Metric tiles and the brand new Epicor Data Discovery (EDD), a Business Intelligence solution intended to provide an extremely easy to use and intuitive data exploration, data visualization experience. 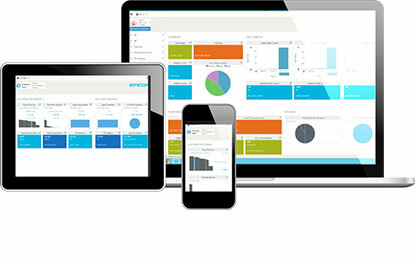 EDD is embedded in the new Active Home page and encompasses a broad set of capabilities for managing, accessing, sharing, cleansing, visualizing, and extracting insights from data created by or related to Epicor created data. The system will come pre-loaded with a variety of home page KPIs that vary depending on your department. Epicor Smart Inventory Planning and Optimization: This new product improves forecast accuracy, reduces product and inventory costs, tracks operational performance and identifies and corrects inventory imbalances. Designed as a cloud-based inventory decision tool it performs against critical metrics such as, actual supplier lead times, and opportunities to re-balance stocks across facilities, to help uncover root causes of operational inefficiencies. You can get a 360 degree view of your inventory – identify value, stocking trends, overstocks, understocks, and potential order cancellations. Plus, identify root causes of stockouts, excess inventory and late deliveries. User defined filters enable the ability to drill into and report on any subset of the inventory. What else does Epicor 10.2 deliver? Other Features: Also included in Epicor 10.2 is Legal numbers in order and purchasing management, enhancements to MES and its integration to Epicor, as well as several other. Ease of Deployment: ERP 10.2 is designed to provide ease of everything from deployment, education, through support, upgrades and maintenance, resulting in greater profitability, productivity and growth – leveraging open architecture and extensibility to future-proof your organization. Call or email one of our TeccWeb consultants to get started!